The first Running of the Bulls with theTorrestrella bull-ranch was quite a clean running. There were some moments of tension and danger in the Santo Domingo stretch where one of the bulls charged at the runners. Some of the bulls fell at the corner of Estafeta and also on the final stretch leading into the bullring. Only five of the six bulls ran as one of them suffered an injury to its leg when the bulls were being brought up to the pens in Santo Domingo last night. The bulls came out in a tight pack, but one of them was charging at runners from the first and it jabbed one runner with its horns on this stretch. The run lasted 2 min. 25 sec. While the three front bulls ran together over the whole course, two of them got separated and fell behind and created some danger for the runners. 13 running bulls. 22 goring. 50 traumatisms. The 38th fastest running of the bulls. The 1st was on 07/13/2011. 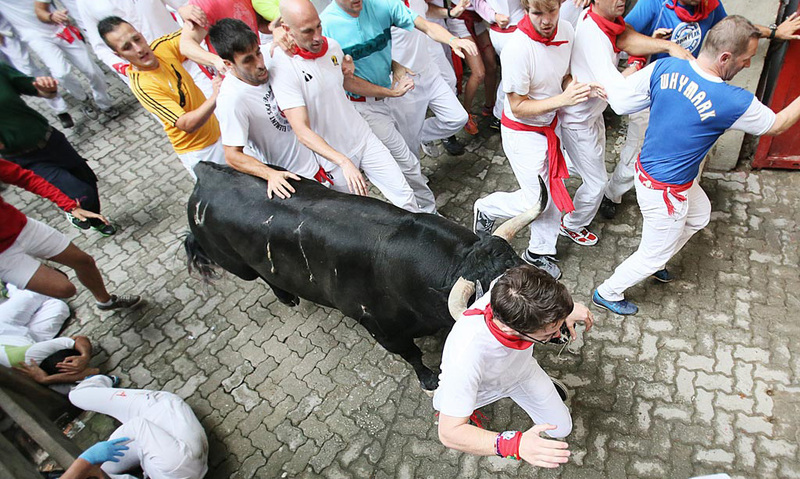 In 13 participations the Torrestrella have caused 22 gorings (1,69 per running of the bulls). Torrestrella is the 6 bull-ranch with the highest average of gorings (1,69 per running of the bulls). In 13 participations this was the 8th time that the Torrestrella caused gorings. The 7th time that a goring took place on Santo Domingo on Monday. The previous took place on 07/12/2004. 3rd goring by Torrestrella on Santo Domingo (0,23 per running of the bulls).